In my childhood years in the Philippines, we ate off of banana leaves when we would hike up to my grandmother’s property in the mountains in her province. I have fond memories of our tour guide, who was known as Uncle Spergion, hacking the banana leaves with his bolo knife when it was time to have lunch as we’d take a break from our hike. Then the moms and aunties would grab the leaves and give them a quick wash in the nearby stream of natural spring water. While us young kids would sit and watch, the older kids helped out in preparing the food. 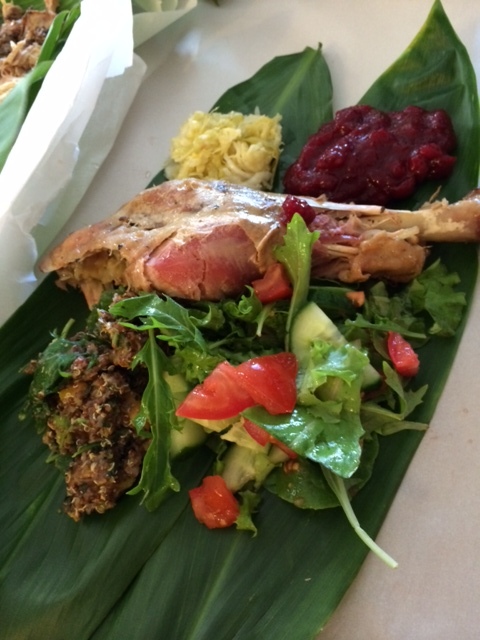 Then the FUN part is we got to use the banana leaves as plates and ate with our hands! Of course we had to wash our hands before we ate. 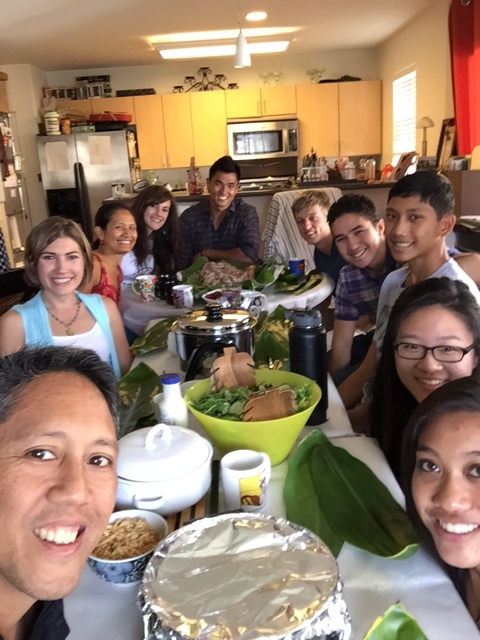 This year at our Thanksgiving lunch, we did just that…except it was at our townhouse. And used ti leaves as we didn’t have enough banana leaves. Not everyone ate with their hands. But a few adventurous ones did! And I like how it was such an easy clean up. Definitely going to try this again! Hope your Thanksgiving with family and friends was filled with love, fun and laugher. And are enjoying the rest of this Thanksgiving weekend! Next Next post: How In the World Did I Survive?